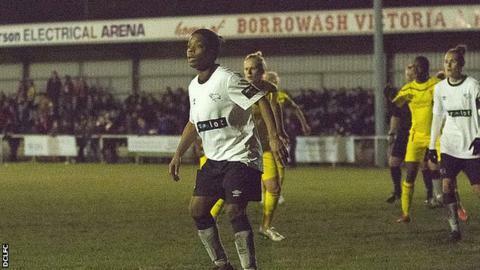 Derby County Ladies are relocating to boost their Women's Super League hopes. The club were last week named Women's Premier League club of the year 2015. But their ground at Borrowash Victoria is not suitable if they win promotion to the second tier of the women's game and so they will play home games at Mickleover Sports FC from 2016. "We want to get in to the Super League and Mickleover are also a hugely ambitious club," chief executive Duncan Gibb told BBC Radio Derby. "Put those two things together and moving is a common sense thing to do." Derby County Ladies were formed in 1990 as Beacon Wanderers. They were approached by Derby County in 1993 and have been associated with the men's club ever since. They have risen from parks football via the ninth tier of the women's game to two leagues below the top flight. The Ewe Rams are currently fifth in the 12-team Women's Premier League North, but only five points separate the top six. Gibb added it was through no fault of their current landlords that they were moving grounds, simply that it was a decision they had to make. He continued: "We recently attended St George's Park where the FA asked a select group of clubs who they believe have opportunities to get in to the Super League and we were delighted to be one of them. "They made it very clear that where we currently play would unfortunately not be suitable for the Super League." More than 400 supporters attended a recent midweek league fixture against Nottingham Forest Ladies - a record for the Premier League in the Women's Super League era - and attendances and support are growing. "We have had two marquee fixtures against [WSL sides] Liverpool and Arsenal drew massive crowds of more than 600," said Gibb. "And in last three years we have increased the amount of investment coming in to the club 14-fold, and in terms of club partners we now have 36. Things are growing on and off the pitch."